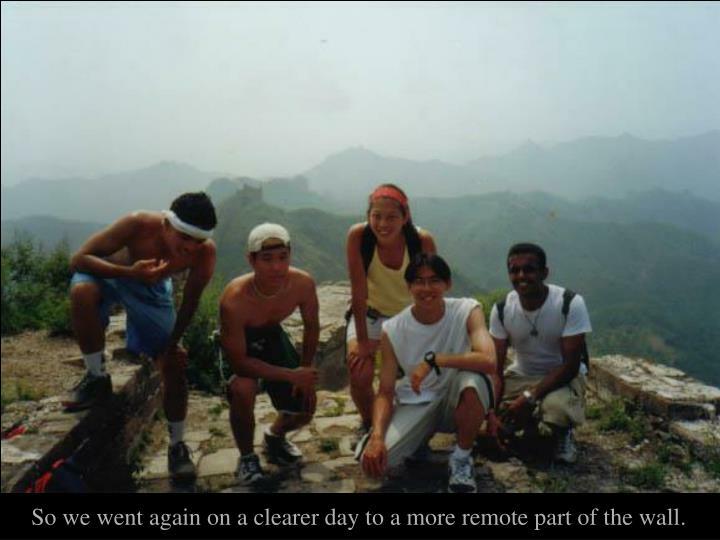 IPENG Study Abroad Beijing, China Summer 2002 By Gautam Kumar Step 1: 14 hour plane ride straight to Beijing! Definitely a bonding experience though. Step 1: 14 hour plane ride straight to Beijing! 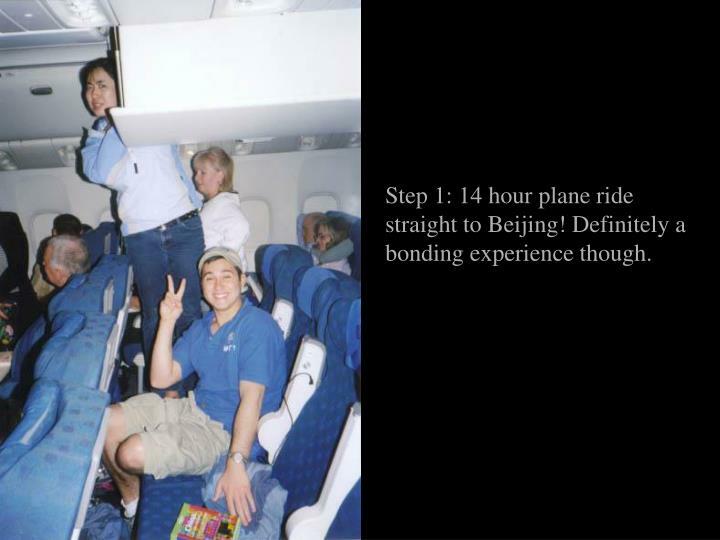 Definitely a bonding experience though. 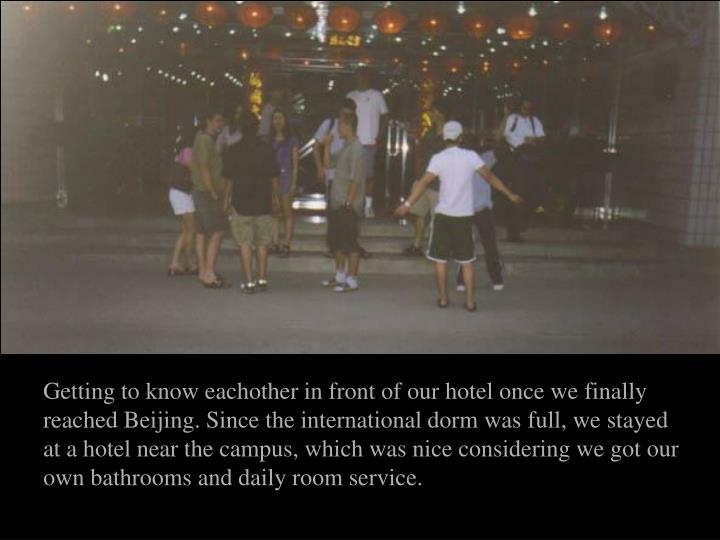 Getting to know eachother in front of our hotel once we finally reached Beijing. Since the international dorm was full, we stayed at a hotel near the campus, which was nice considering we got our own bathrooms and daily room service. 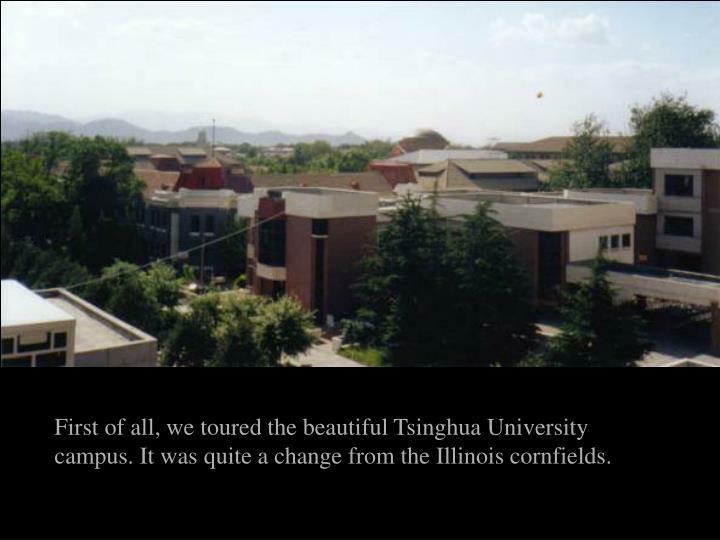 First of all, we toured the beautiful Tsinghua University campus. It was quite a change from the Illinois cornfields. Not bad scenery on our way to class. Wait a second… that looks like Foellinger. 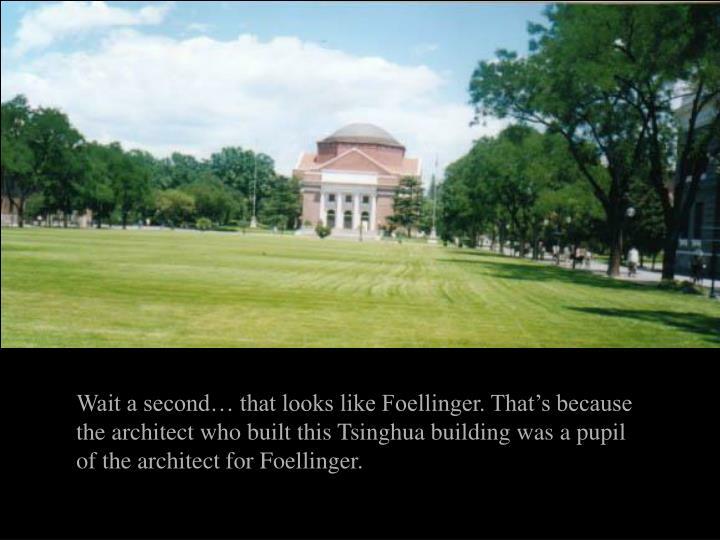 That’s because the architect who built this Tsinghua building was a pupil of the architect for Foellinger. 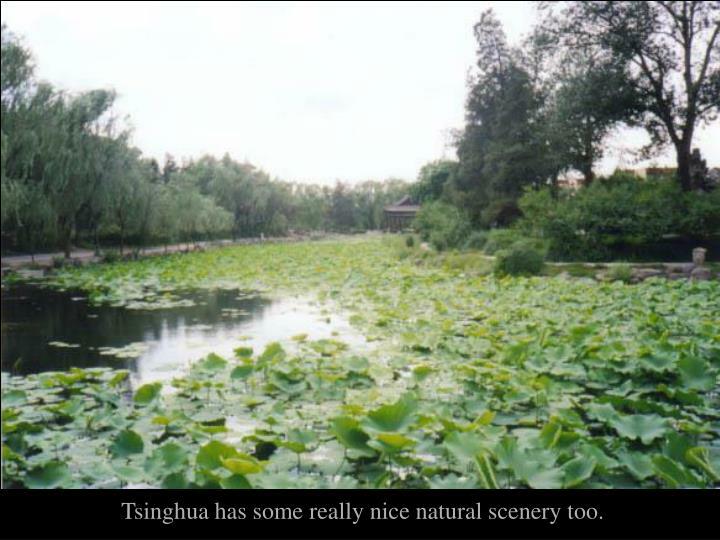 Tsinghua has some really nice natural scenery too. Sometimes it looks more like a botanical garden than a university. 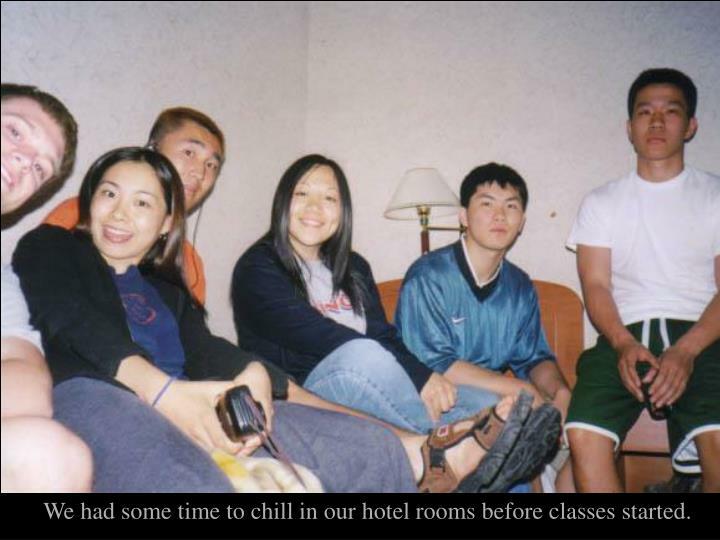 We had some time to chill in our hotel rooms before classes started. 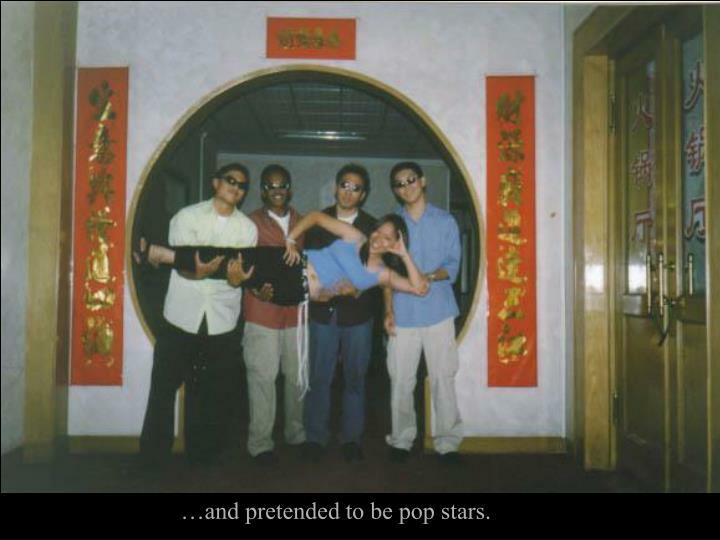 …and pretended to be pop stars. A lot of time was spent eating too. We had an allowance to spend at local restaurants. 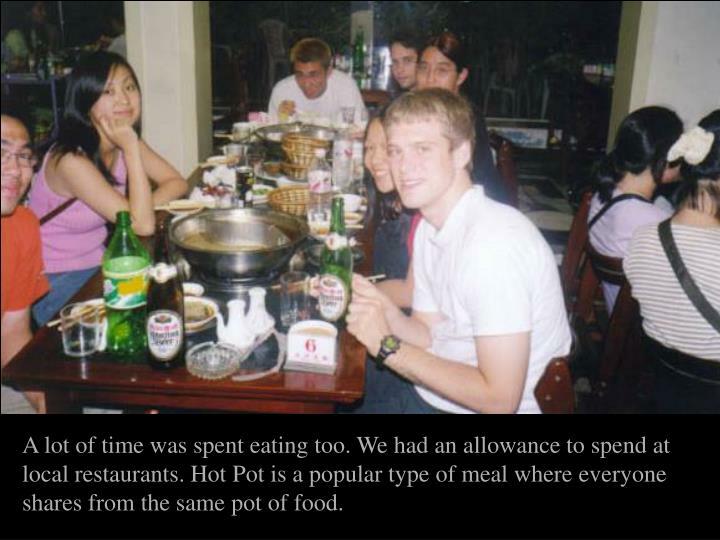 Hot Pot is a popular type of meal where everyone shares from the same pot of food. 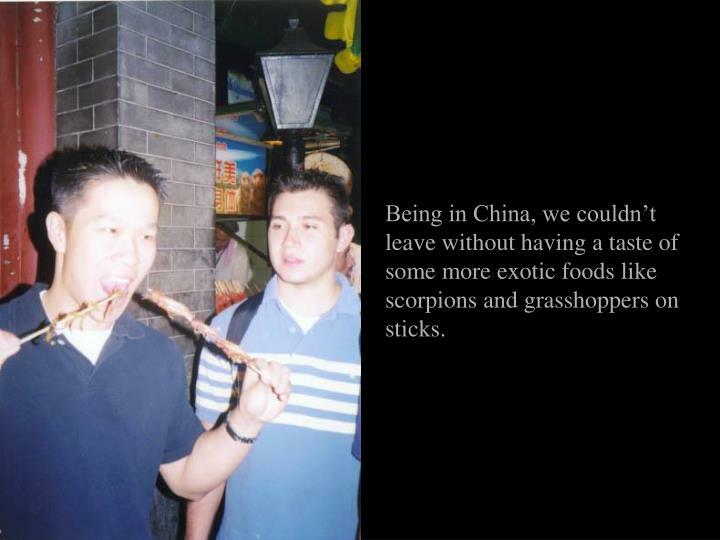 Being in China, we couldn’t leave without having a taste of some more exotic foods like scorpions and grasshoppers on sticks. 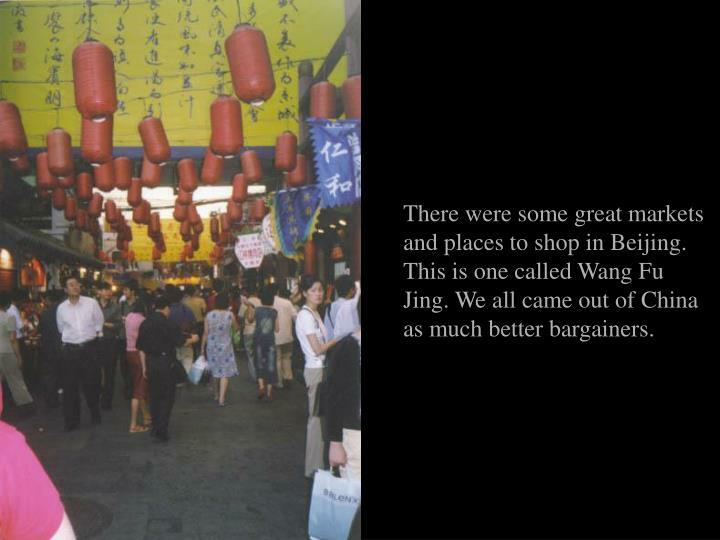 There were some great markets and places to shop in Beijing. This is one called Wang Fu Jing. 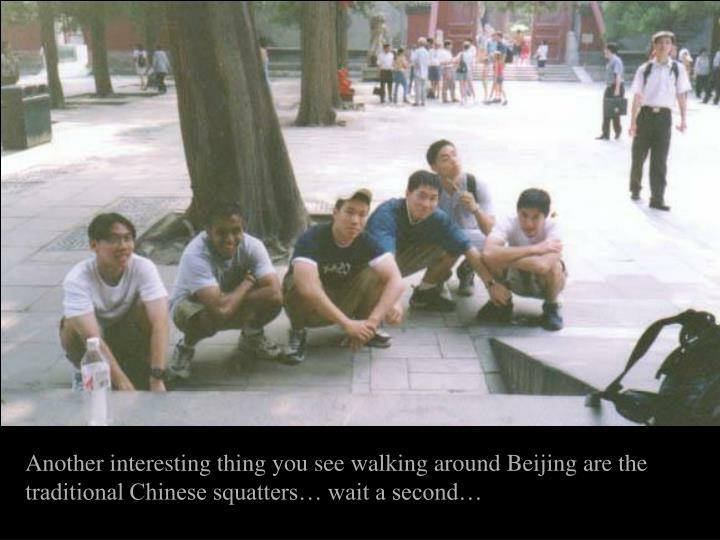 We all came out of China as much better bargainers. 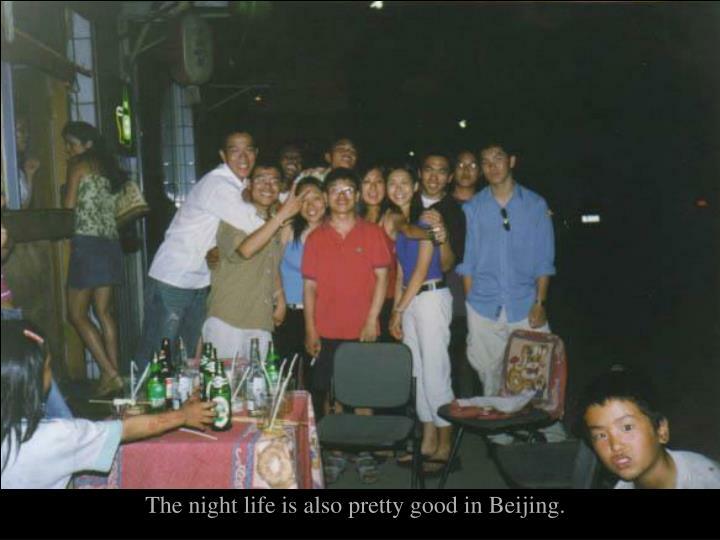 The night life is also pretty good in Beijing. Of course, we couldn’t forget about classes. 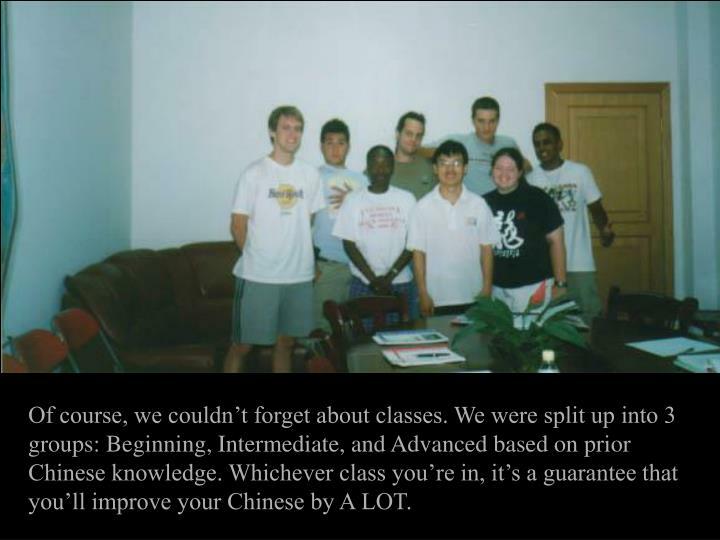 We were split up into 3 groups: Beginning, Intermediate, and Advanced based on prior Chinese knowledge. 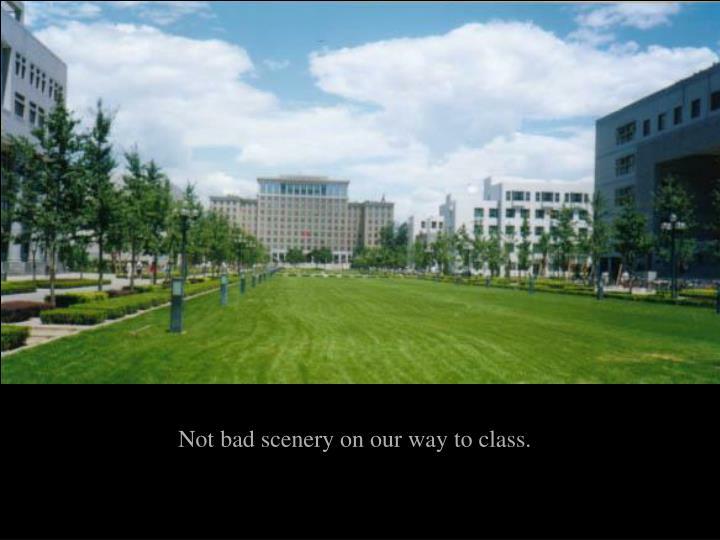 Whichever class you’re in, it’s a guarantee that you’ll improve your Chinese by A LOT. We also had the opportunity to take classes in Tai Chi and Calligraphy. This is us practicing Tai Chi with the hotel attendant. 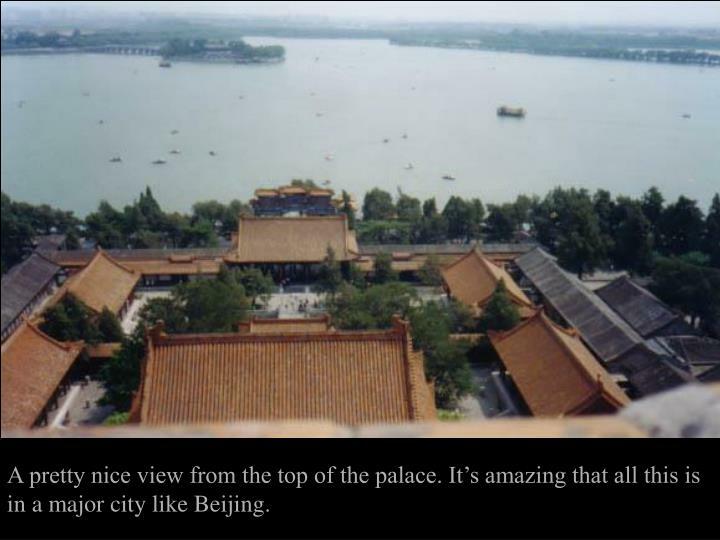 We were also taken around to see Beijing. 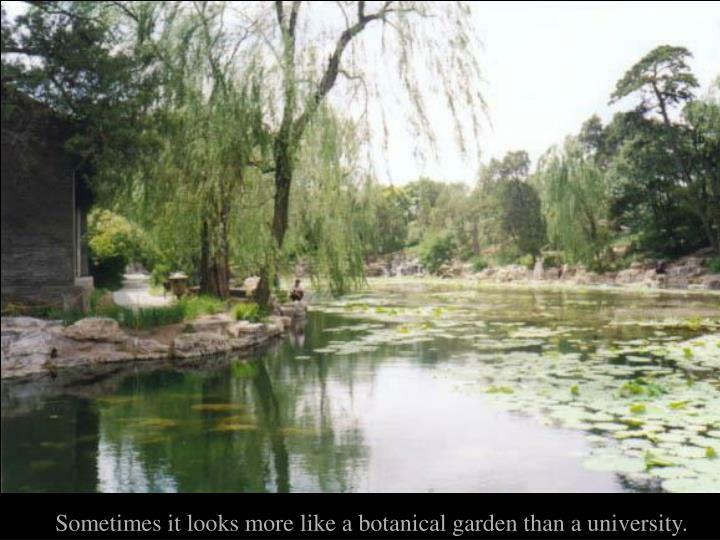 This is a lake at Beijing University. 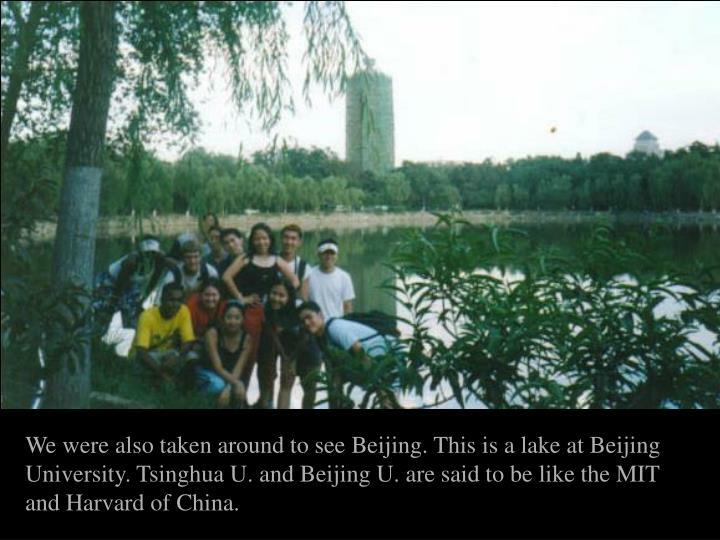 Tsinghua U. and Beijing U. are said to be like the MIT and Harvard of China. 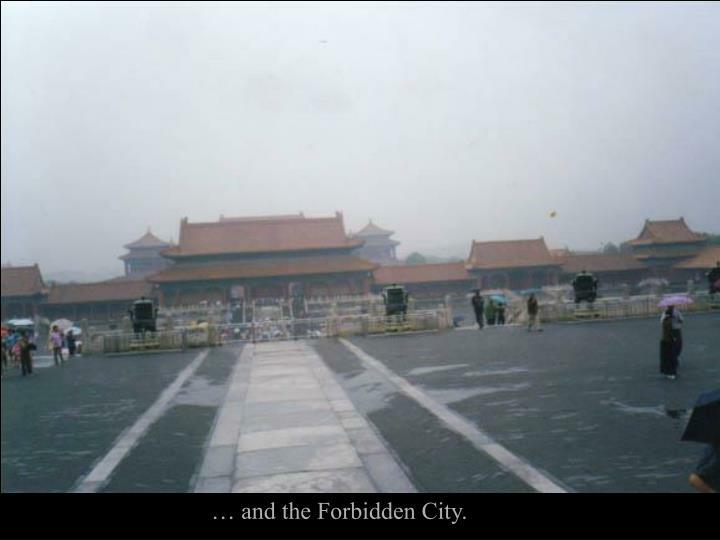 … and the Forbidden City. 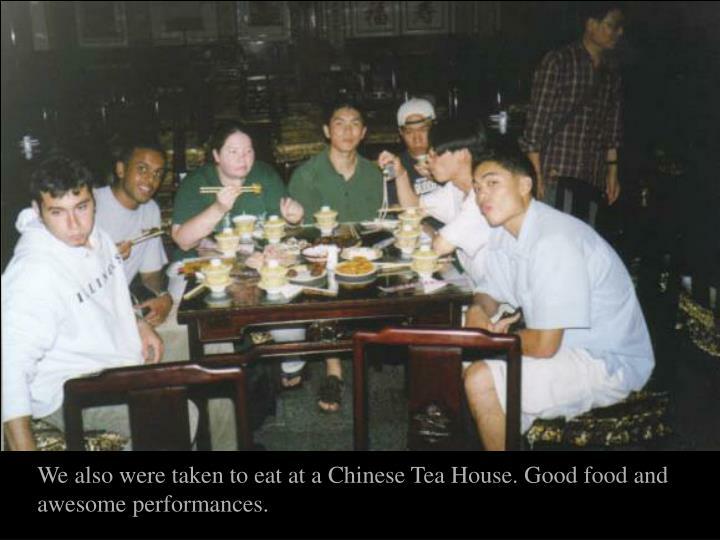 We also were taken to eat at a Chinese Tea House. Good food and awesome performances. 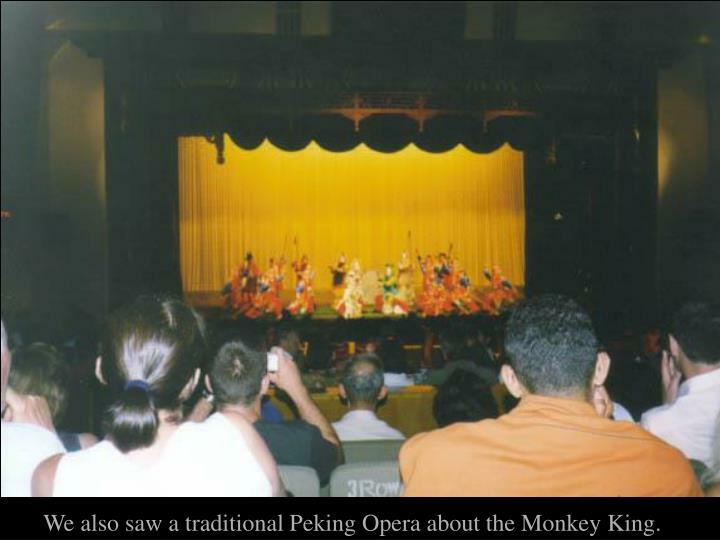 We also saw a traditional Peking Opera about the Monkey King. 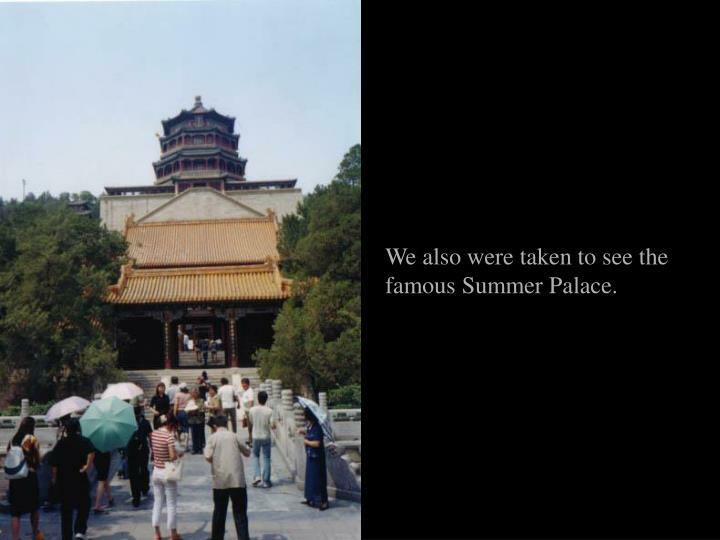 We also were taken to see the famous Summer Palace. A pretty nice view from the top of the palace. It’s amazing that all this is in a major city like Beijing. 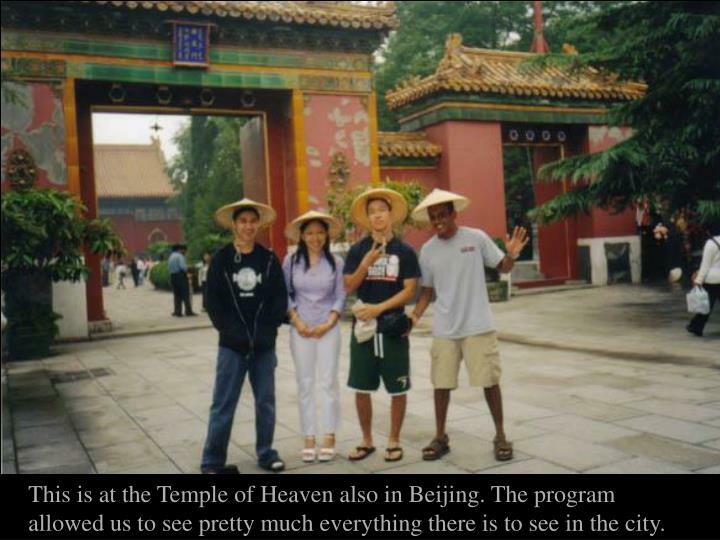 This is at the Temple of Heaven also in Beijing. 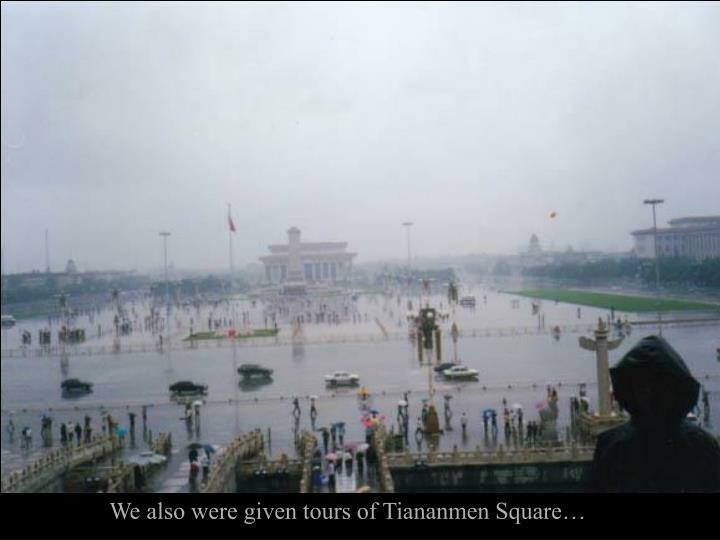 The program allowed us to see pretty much everything there is to see in the city. 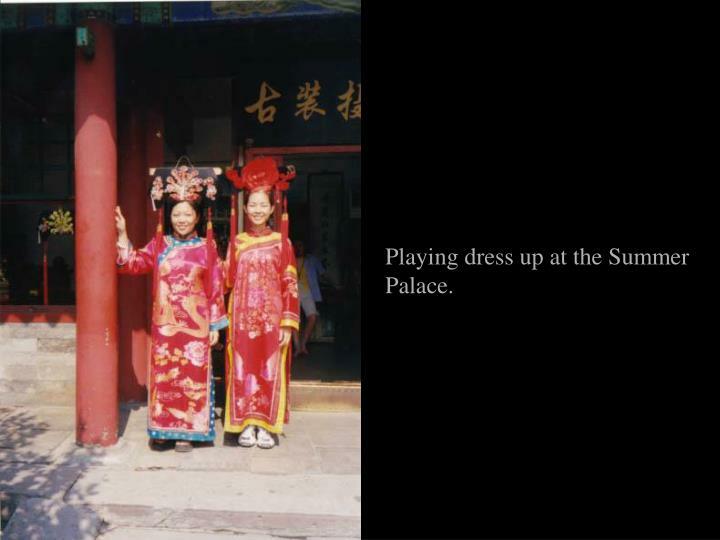 Playing dress up at the Summer Palace. 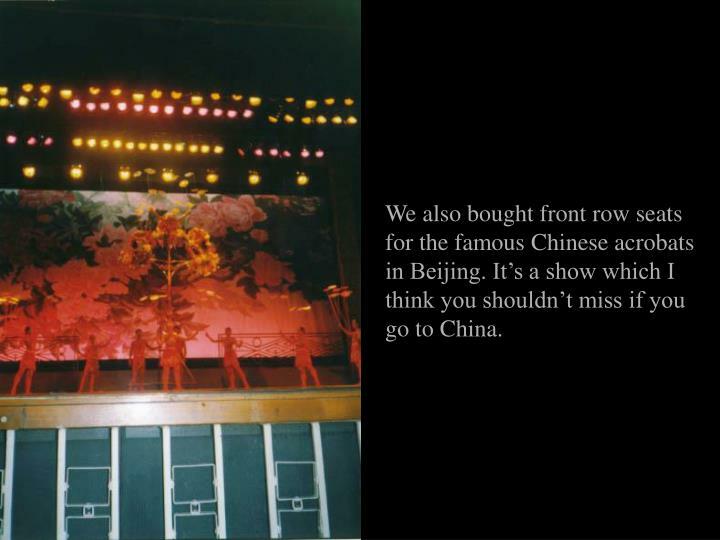 We also bought front row seats for the famous Chinese acrobats in Beijing. 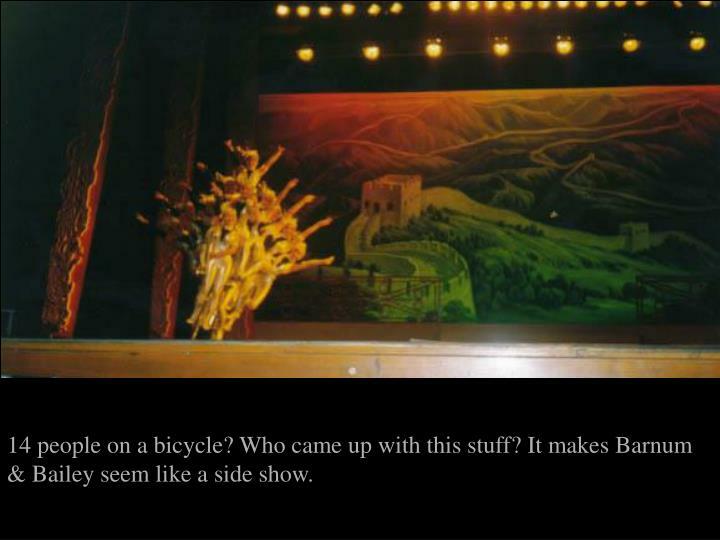 It’s a show which I think you shouldn’t miss if you go to China. 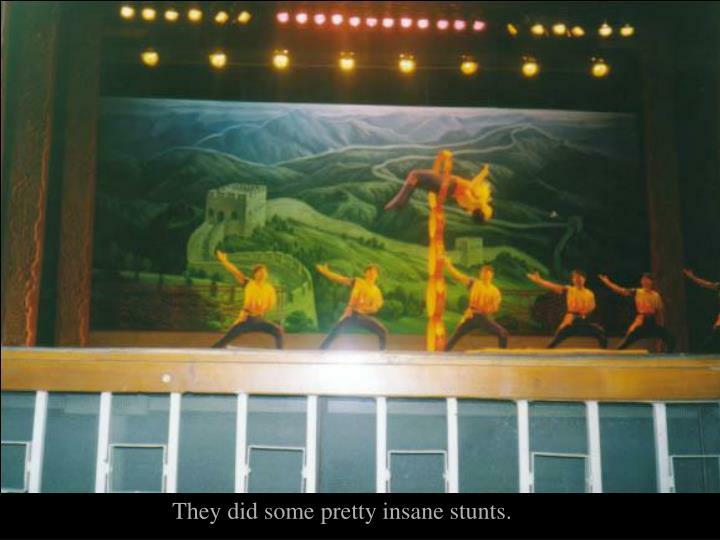 They did some pretty insane stunts. 14 people on a bicycle? Who came up with this stuff? It makes Barnum & Bailey seem like a side show. 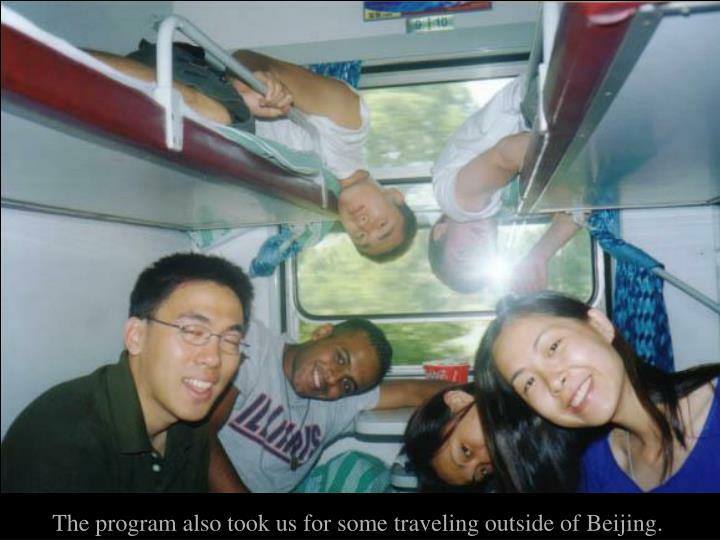 The program also took us for some traveling outside of Beijing. 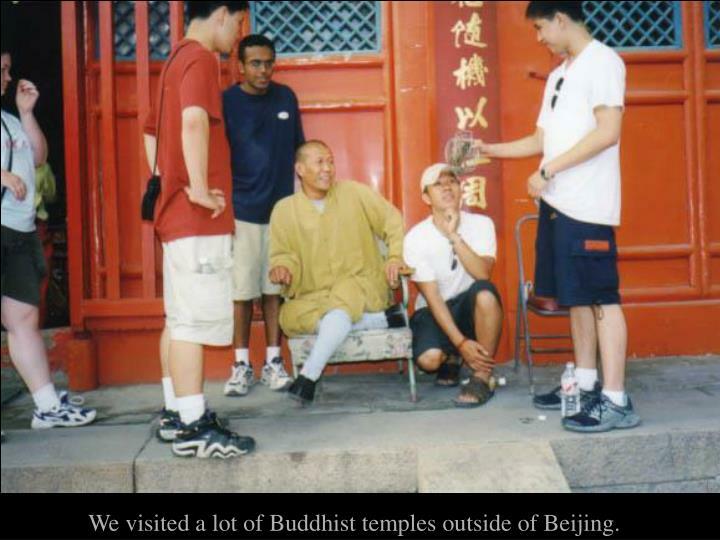 We visited a lot of Buddhist temples outside of Beijing. 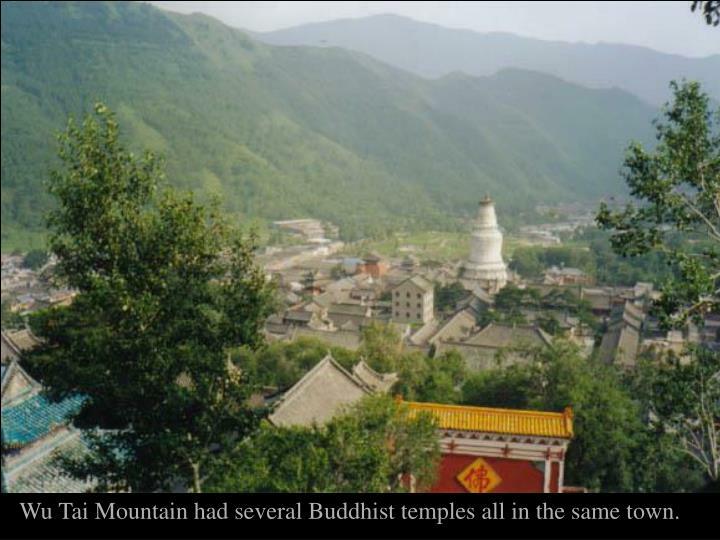 Wu Tai Mountain had several Buddhist temples all in the same town. 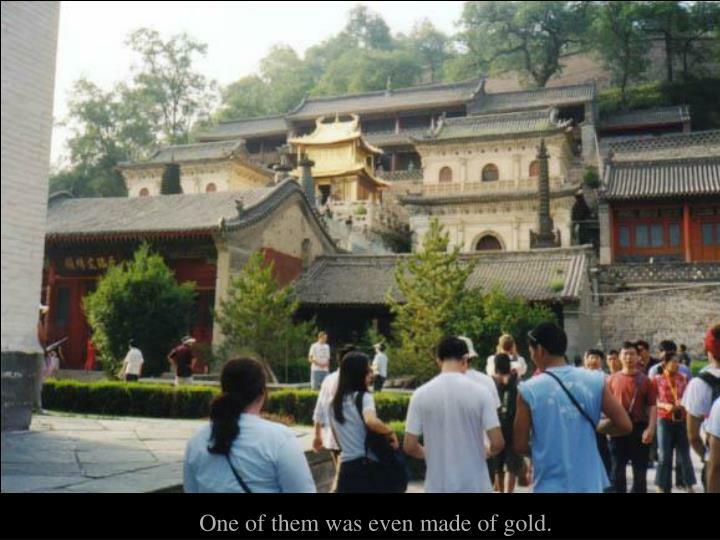 One of them was even made of gold. 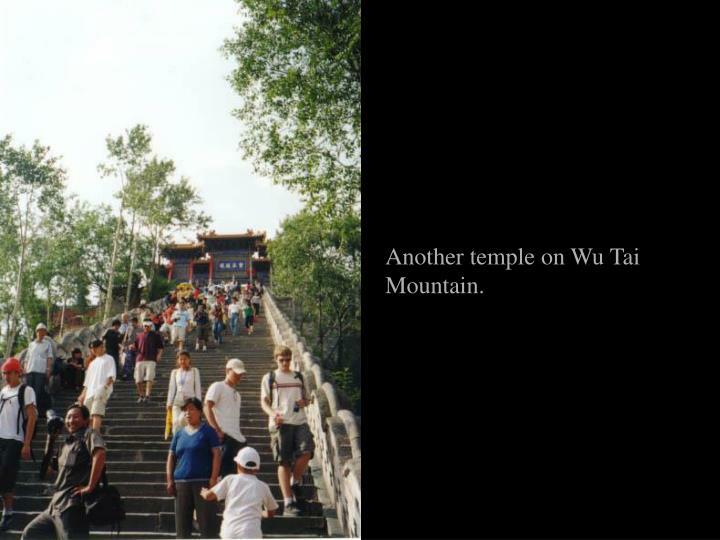 Another temple on Wu Tai Mountain. The program also included a visit to the caves in a town called Datong. 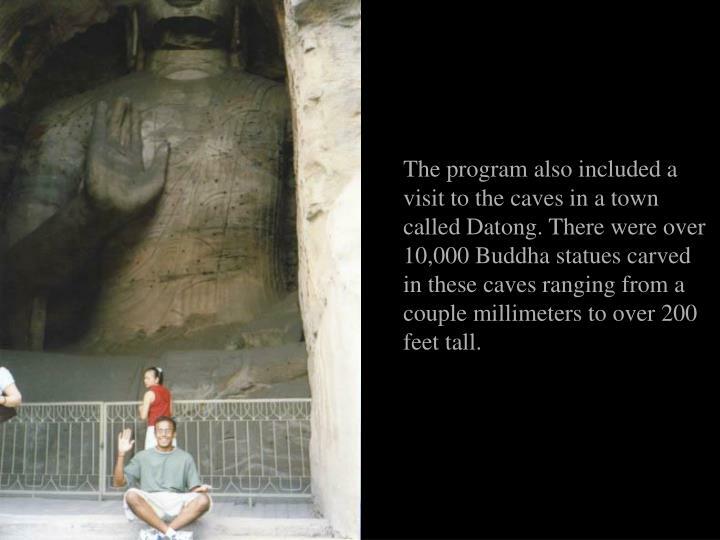 There were over 10,000 Buddha statues carved in these caves ranging from a couple millimeters to over 200 feet tall. So we went again on a clearer day to a more remote part of the wall. 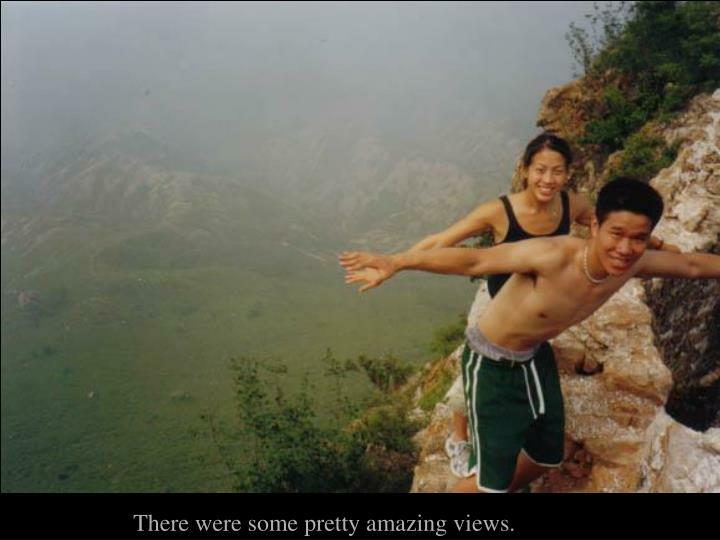 There were some pretty amazing views. 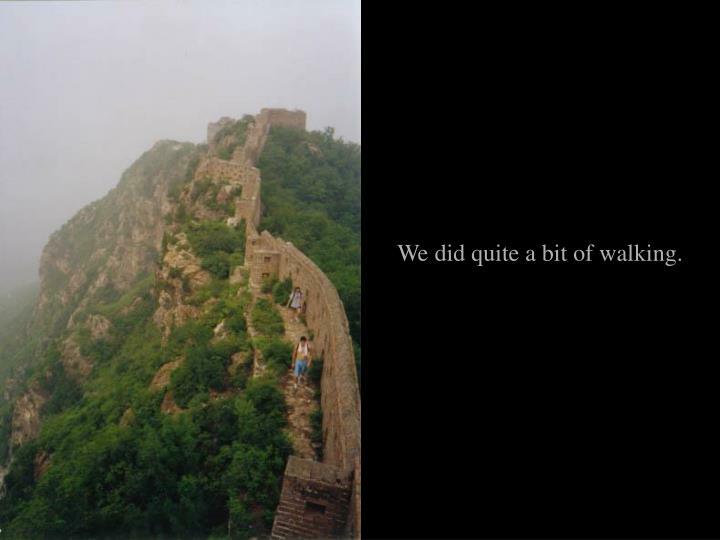 We did quite a bit of walking. 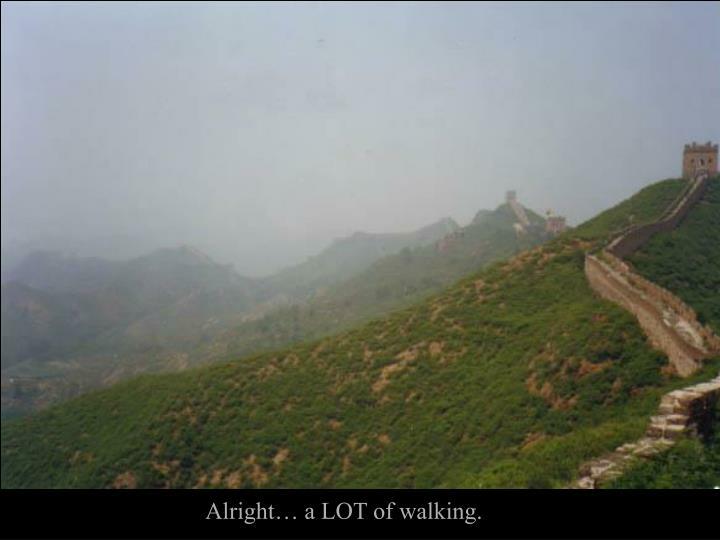 Alright… a LOT of walking. 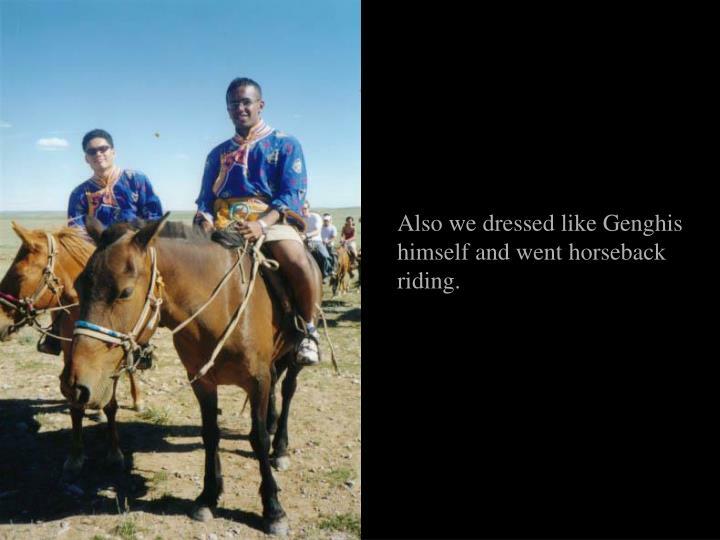 Also we dressed like Genghis himself and went horseback riding. 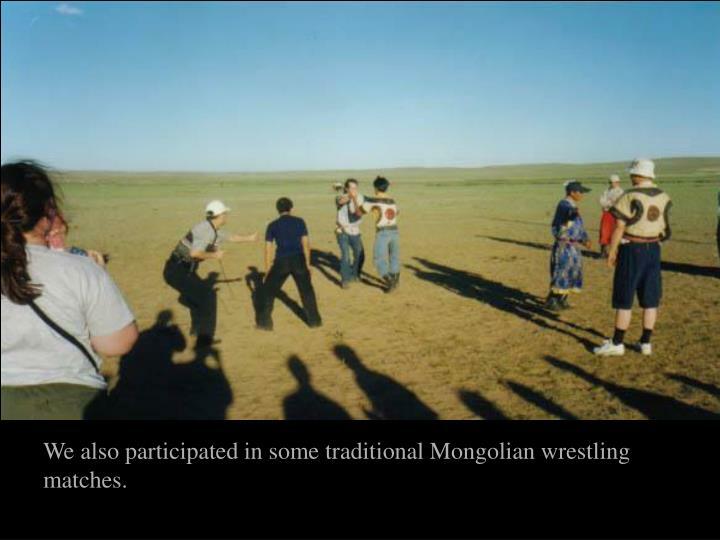 We also participated in some traditional Mongolian wrestling matches. 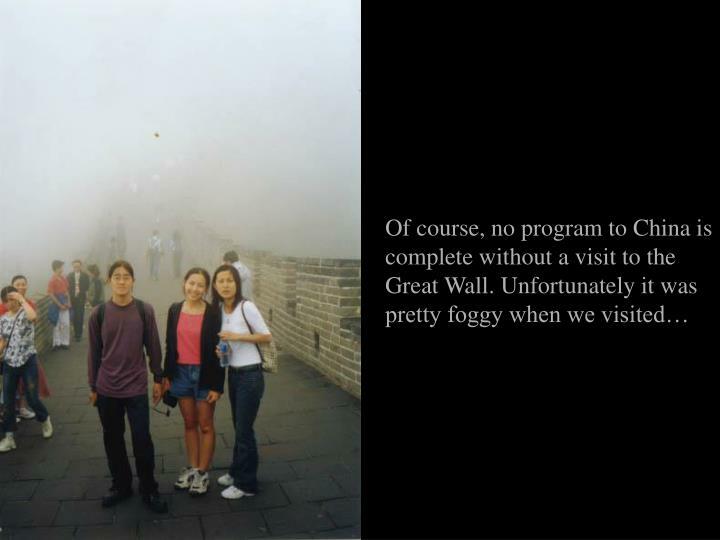 Overall, our trip to China was definitely an experience we won’t soon forget. Few people have the chance to visit such far off and exotic places and have so many crazy adventures. 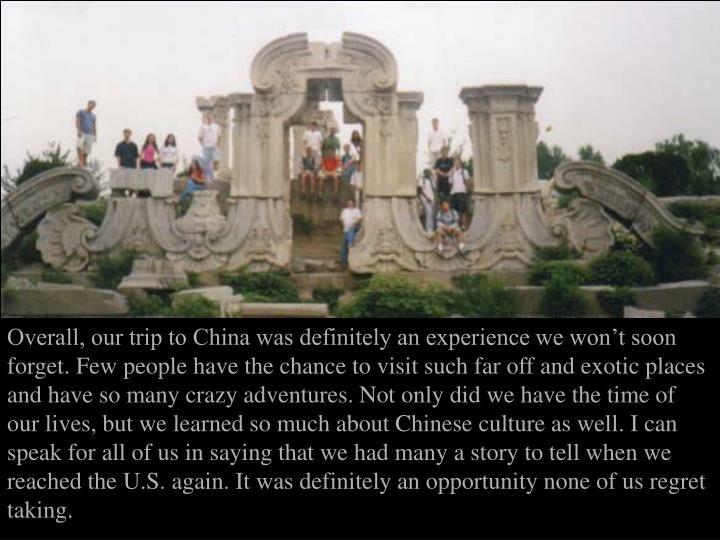 Not only did we have the time of our lives, but we learned so much about Chinese culture as well. I can speak for all of us in saying that we had many a story to tell when we reached the U.S. again. It was definitely an opportunity none of us regret taking.